Linton classes are based around the British Gymnastics Core Proficiency Awards. General Gymnastics encourages gymnasts to learn a variety of skills from other disciplines such as Artistic Gymnastics and Rhythmic Gymnastics, Sports Acrobatics and Trampolining. 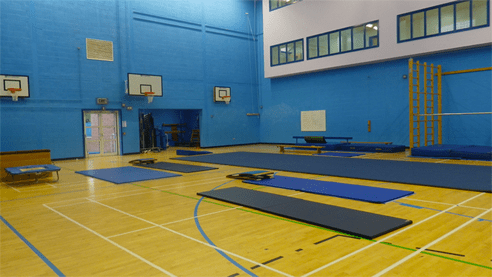 At Linton we have access to a matted floor area, Vault, trampette, 2 bars, benches, 2 trampolines, medium and a full size beam. During the classes, gymnasts progress towards achieving badges 8 – 1 of the British Gymnastics Proficiency Award Scheme followed by the Dynamics Gymnastics Award Scheme, bronze to gold. The classes are at the new Linton Village College gymnasium. Linton Village College can be found at the beginning of the village on the left hand side if approaching on the A1307 from Cambridge and at the end of the village on the right hand side if approaching on the A1307 from Haverhill. The car park can be found at the bottom of the main driveway.